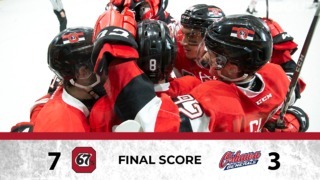 The Ottawa 67’s improved their pre-season record to a perfect three wins and no losses on Monday afternoon in a Labor Day matchup that was played at the Cornwall Civic Complex. Marco Rossi and Cameron Tolnai found the back of the net for Ottawa, as Cedrick Andree was once again solid in front of the cage especially during crunch time in the shootout, stopping all seven attempts coming from Kingston players. The first period was marked by a pair of 67’s 2018 first round picks, as Marco Rossi and Cameron Tolnai put the 67’s on the board during the opening 20. A good crowd in Cornwall saw Ottawa head to the locker room with a 2-0 lead. Kingston cut the Barber Poles’ lead in half during the second period with a goal coming from the stick of forward Ryan Cranford. Only one goal was scored in the third period. The 67’s were holding on to a one goal lead when the Frontenacs were able to tie the game up with just over 41 seconds to go. 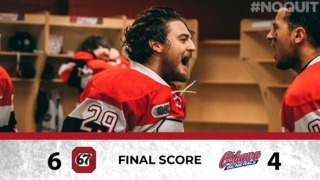 No winner was found in overtime, so the game moved to the shootout, where Cedrick Andree played hero for the 67’s, denying all seven shooter to give the Barber Poles the win. 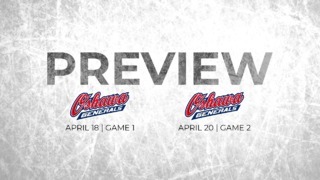 Ottawa will return to action on Friday, September 14 when they go across the bridge to face the Gatineau Olympiques at Complexe Branchaud-Briere. The puck will drop at 7:30 pm. The Barber Poles will open their regular season at home on Saturday, September 21st at TD Place against the Mississauga Steelheads.